Sunny - yes; but going over 100F is not very pleasant. It was already 80F when I left for work at 7am. I like the sun, but not the heat! It's 82 F degrees here and heading upwards. I'm a 65F - 75F degree person! Maen. Absolutely beautiful Saturday on the Sunshine Coast. Had fine visit with a 96 y.o. auntie who has just come out of a three week stay in the hospital as well as see her children on the way out of Gibsons. Everybody!! 56F now, will reach 90F by 3pm. Means I will take my walk mid-morning. Shiela, I could use a bit chillier temps! Even in the upper 60's I still come home sweaty if not downright drippy after my run! ...seems as if there are varying views of your welcome rays, Sunny! We waited soooo long for this, so now I'm hesitant to utter a single sound close to a complaint - too soon gone... & too soon snow shovels! Have a weather-perfect day - however that translates for each of you! 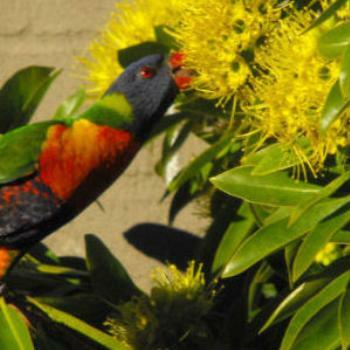 Oh, the joys of seeing such vibrant plumage flitting around your yards - I am so envious! 3 days ago, two (yes! -2) Pileated Woodpeckers stopped at an ancient dead stump in our back yard for maybe 10 minutes - that was a major first for me! They are quite spectacular - in size as well as resemblance to Woody the woodpecker! everybody. From a rainy afternoon in the beautiful Emerald Isle. Still warm though, comfortable 21°c. Toured around some of the country lanes yesterday taking in the local area. Today we went to Roscommon to do grocery shopping. Everything seems so cheap but I guess it's all relevant. all. We're awaiting some much needed rain. Fingers crossed! Is that the Gibsons where Molly's Reach is Wow_Axel? We visited there many years ago. Gorgeous place. Rage - thanks for the weather update in the Fair Isle. May need it in the near future! Joyce, the pileated woodpeckers are incredible! Several years ago one tried to get into one of our smaller feeders. It was hilarious to watch him trying to hang on. My sister has Pileated Woodpeckers come to her feeder year round in Northern Michigan. They will be my next birds painted since I told her I was painting a watercolor of them for a housewarming gift for her new house. What a beautiful bird! Wish we had them here. The local municipal golf course had pileated woodpeckers a few years back. Morning all, great photo of the Rainbow Lorikeet . Looked up the pileated woodpecker , beautiful bird. Rats! Just missed it. Oh well, think I'll have a brew anyway. A Copper, please. Oops. Copper is an amber ale brewed and bottled at The Olde Mecklenburg Brewery in Charlotte, North Carolina. Rage, if you get the chance visit Avoca (Of Ballykissangel fame). It's over the Wicklow Mountains where your Guinness originated. Near there is a place called The Meeting of the Waters. Just sit a while and take in the ambience. It's a magical spot. You're not far from the National Stud, that's worth a visit. And the sculpture of Cuchullain (?) on a roundabout near The Curragh will impress you too. Enjoy your stay in my homeland. Missed 22, but I'll go for the page turn.